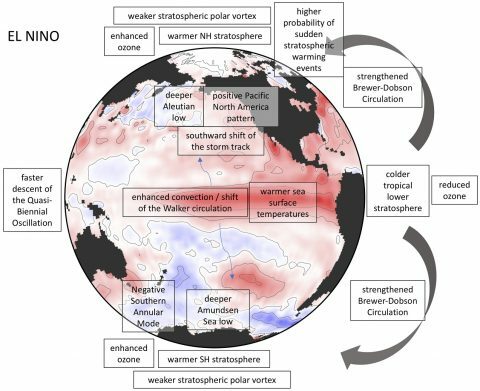 El Niño–Southern Oscillation (ENSO), the atmosphere–ocean coupled phenomenon associated with multi-year variations in the sea surface temperatures in the tropical Pacific, can lead to extreme changes in weather around the globe through so-called teleconnections. ENSO teleconnections extend into the stratosphere, the layer of the atmosphere above the troposphere where most of Earth’s weather takes place. Variability in the stratosphere can also influence surface weather, both in the tropics and in the polar and midlatitude regions. A recent paper in Reviews of Geophysics describes the observational and modeling work over recent decades that has increased our knowledge about how ENSO alters the conditions in the stratosphere from the tropics to both poles. Here, the authors of the paper give an overview of our understanding and outline the research challenges that remain. How do El Niño events affect the stratosphere? 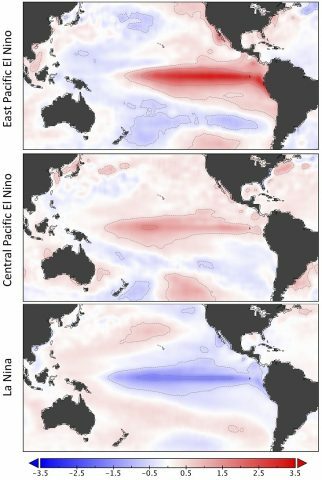 During the warm phase of El Niño, increased atmospheric convection in the tropical Central Pacific drives large-scale atmospheric waves that influence weather far from from the tropics. These waves can amplify vertically into the stratosphere, which strengthens the equator-to-pole circulation in the stratosphere (the Brewer-Dobson circulation), enhancing the upward motion in the tropics and downward motion at the poles in the stratosphere. This circulation change is associated with a cooling of the tropical lower stratosphere, and a warming of the polar regions in both hemispheres. The anomalous wave propagation also weakens the stratospheric polar vortex, leading to a higher probability of so-called sudden stratospheric warming events, which can induce cold air outbreaks over Europe. The changes in tropical heating and convection also influence the tropical stratosphere. In the lower tropical stratosphere, a cooling is observed along with a decrease in ozone during El Niño, with strong zonal asymmetries, especially in the lowermost stratosphere. The wind anomalies associated with the tropical stratospheric Quasi-Biennial Oscillation (QBO) tend to propagate downward faster during El Niño than during La Niña. How are stratospheric processes differently affected during La Niña events as compared to El Niño? During La Niña events, the opposite stratospheric response is observed in most regions, but the response is not symmetric between El Niño and La Niña for all observed impacts and regions. For example, the observed frequency of Arctic sudden stratospheric warmings is similar for El Niño and La Niña winters rather than being opposite. Even in regions where the opposite response is observed, La Niña and El Niño events of a similar strength (as measured by the magnitude of the sea surface temperature anomalies in the tropical Pacific) do not necessarily produce teleconnections of equal magnitude for both the troposphere and the stratosphere. It is not clear whether some of these observed differences in La Niña and El Niño teleconnections arise from the asymmetric forcing in the tropical Pacific, or if they reflect internal atmospheric variability affecting the teleconnections. What are some of the challenges with observing and modelling these teleconnections? It is still unclear if the disagreement between models and observations is a result of model biases, sampling issues, or other factors. While models are able to produce a large number of ENSO events, they exhibit their own limitations: coupled atmosphere–ocean models are not fully able to reproduce the coupling between the atmosphere and the ocean, resulting in ENSO events that are biased in terms of strength and location. ENSO teleconnections in models appear more linear than those observed, and it is still unclear if the disagreement between models and observations is a result of model biases, sampling issues, or other factors. What have been some of the recent advances in our understanding of the teleconnections between El Niño and the stratosphere? It has recently become apparent that long-range forecasts of several weeks to months can be improved by incorporating the stratospheric state, and teleconnections from the tropics to the stratosphere are a crucial part of improving the predictability of extreme and persistent weather events for densely populated regions such as Europe. What are some of the unresolved questions where additional research, data or modeling are needed? Despite the recent advances in the understanding of ENSO teleconnections to the stratosphere, a range of unresolved questions remain. With the longer data record, trends and decadal variability in the connection between ENSO and the stratosphere have been detected. For example, the connection between El Niño and the Arctic appears to have weakened recently, though the reason for this remain unknown. It also remains to be seen whether potential nonlinearities found in the ENSO impacts can be traced back to the different strength (i.e., the longitudinal location in terms of peak sea surface temperature anomalies in the tropical Pacific) of ENSO events or if they can be attributed to nonlinear or threshold behavior in the teleconnections themselves. Interactions with other phenomena, e.g. the QBO, are another source of uncertainty for variability and change in these teleconnections. Citation: Domeisen, D. I. V., C. I. Garfinkel, and A. H. Butler (2019), Global impacts of ENSO’s reach into the stratosphere, Eos, 100, https://doi.org/10.1029/2019EO115943. Published on 19 February 2019.